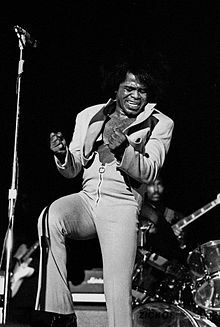 James Joseph Brown (Mey 3, 1933 – December 25, 2006) wis an American sangster, sangwriter, record producer, dancer an baundleader. The creator o funk muisic an a major figur o 20t century popular muisic an dance, he is eften referred tae as the "Godfaither o Soul". In a career that spanned sax decades, he influenced the development o several muisic genres. ↑ James Brown (1998). Notable Black American Men. Farmington Hills, Michigan: Thomson Gale (Document no. K1622000047). Retrieved January 12, 2007, from the Biography Resource Center database. ↑ Doran, John. "James Brown – 10 of the Best". The Guardian. The Guardian. Retrieved October 31, 2015. ↑ Wiegand, D. (December 26, 2006). James Brown: 1933–2006 – Godfather of Soul Changed Music at Frenetic Pace. San Francisco Chronicle. Retrieved January 10, 2007. This page wis last eeditit on 11 Apryle 2017, at 17:37.